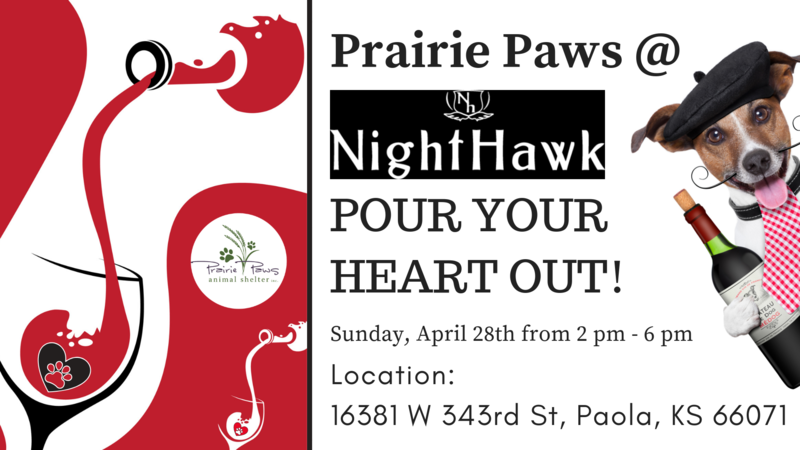 Enjoy a glass of wine, pet dogs (maybe adopt one), listen to music, eat and support Prairie Paws Animal Shelter at this family-friendly event at the NightHawk Winery. Enjoy amazing wine and/or off the charts delicious Sangria! Get hungry or come hungry? No problem. Josh Hursey from Farm Fusion will be there cooking up some yummy memories. Like music while enjoying a glass of vino? No problem. Wade Brown will be entertaining everyone with awesome live music, and… you can bring the kids! There will be outdoor games they can enjoy. Come meet your new best friend, pour your heart out, eat some yummy food, help support a great cause and enter the Michel Kors purse raffle. Rain or shine event! See you there!